Walking without our backpacks feels so much lighter! For the next few days, we will leave our backpacks in our hotel room in Kochi city, and walk the pilgrimage route between the temples in the Kochi area with just a small daypack. I have found that holding only light-filled thoughts in my mind all day, helps a lot with my energy level. I’ve also found that I have more energy if I skip lunch, or have only a salad or a piece of fruit, instead of a full lunch. I do drink a lot of water and unsweetened green tea. Luckily, Japan has a very elaborate recycling system for all the plastic bottles that everyone (including us) consumes daily. Beside newspapers, cardboard boxes, glass, plastic and aluminum, they also recycle the small supermarket packages that are used for all the individual prepared dishes that you can buy. It was so hot during the day, that I did not feel any hunger at all. I believe that fasting is more than simply a detox and a cleanse. I really enjoy fasting, and believe that it is a useful tool to learn to control bodily cravings and to tame our ego’s wild horses. When fasting, I have discovered that the “signal of hunger” that we all get, is nothing more than a habit. If you regularly eat lunch at around 12:00-1:00 pm, your body will send a signal of hunger around that time, even if you carry many extra pounds of fat on your body and you do not need any extra food for energy for many weeks. Fasting works very well for me, and this has been the first day in the pilgrimage that I was not so tired at the end of the day. We started the day with a great breakfast at the hotel Sansuein in Kochi. There was a large buffet filled with many veg choices. We got a tray and a plate divided into nine small squares. We put a small amount of each kind of food in the small squares. I chose two kinds of seaweed, freshly made tofu with grated raw ginger, scallions and soy sauce, some cooked baby eggplant with Yuzu lemon soy, cooked onions in tomato sauce, a raw salad, an array of pickles, roasted sweet potatoes, cooked cabbage, a bowl of miso soup and fresh fruit. Even though it sounds like a lot of food, in each square there was only room for a few morsels. I decided today to buy a traditional wide brim Henro (pilgrim) hat. The hat that I brought from home does not really shield me from the strong sun, and yesterday evening while washing in the Onsen, I noticed that I was getting very red, even though it had been a cloudy and rainy day. This Henro hat comes with a rain cover that looks a little like an oversized shower cap, to protect the straw hat from the rain. The wide brim helps with shading the pilgrim from the rain as well as from the months of walking in the bright sun. I bought the Henro hat from a shop at the foot of Dainichiji Temple, Temple 28. The lady shop keeper was in awe of our plan to walk the whole length of the pilgrimage and visit all 88 temples. It appears that the majority of people do not take the time to do it all in one go, but divide the pilgrimage into sections. Walking such long distances is very challenging and it takes a lot of time. Most people feel that time is a precious commodity that they do not have enough of. We have not met many people on our pilgrimage who intended to walk the whole pilgrimage in one go. Today in a rest area, I met a Japanese pilgrim. He told me that last year, he walked to all the temples in the Tokushima prefecture, and that this year he will walk to all the temples in Kochi prefecture. He plans to continue next year and the year after, so that he finishes his pilgrimage in four years. He rubbed his legs and said that it is so difficult, that every part of his legs, from his thighs to his knees, his calves and his feet are all hurting. At Dainichiji we saw many devoted Buddhist pilgrims who had come to pray. We usually try to avoid the crowds, and wait until we can do our chanting in quiet. From Dainichiji Temple we walked along rice fields with narrow roads, to Kokubunji, temple 29. I saw white cranes rising into the blue sky, white butterflies fluttering around Jules as he walked, beautiful kitchen gardens and beautiful roofs on farm houses. I love seeing old farm houses that are so neat and manicured, with such elaborate tile roofs. In contrast to Japanese cities where people live in small spaces and impossibly tiny apartments, theses farmhouses with their glorious decorative roofs, look like estate mansions. But they are not luxury holiday homes owned by wealthy people. They are just loved family farmhouses where space is not at a premium and where people invest in their homes and and nest in their living environment. The people living in those houses take the time to plant flowers around their well maintained kitchen gardens, make stunning topiary from the trees at the entrances to their houses and cultivate large rice fields almost entirely by hand. Kokubunji temple (temple 29) is a Prefectural Temple for all of Kochi, so its buildings and grounds are especially spacious and well maintained. It has a beautiful Japanese garden with an elaborate topiary. We saw two gardeners cultivating a moss garden, using hand tweezers to remove almost unseen little weed seedlings. It takes days to manicure a patch of moss that looks like grass in the camera. It was ambitious to try to get to Zenrakuji, (temple 30) by five PM, when they closed, as it was already past 3:00 pm when we completed our prayers at Kokubunji, and we still had more than 7 km to walk to get to Zenrakuji. My tired legs rose up to the task, and we walked at high speed along the twisting roads between temples, and made it to the temple with time to spare before the office closed. In our rush, we first entered a glorious Shinto shrine nearby, but unfortunately had to leave and go next door to the Buddhist temple. On Shikoku, many Buddhist temples have Shinto shrines nearby, and both are worshipped hand in hand by the local people. 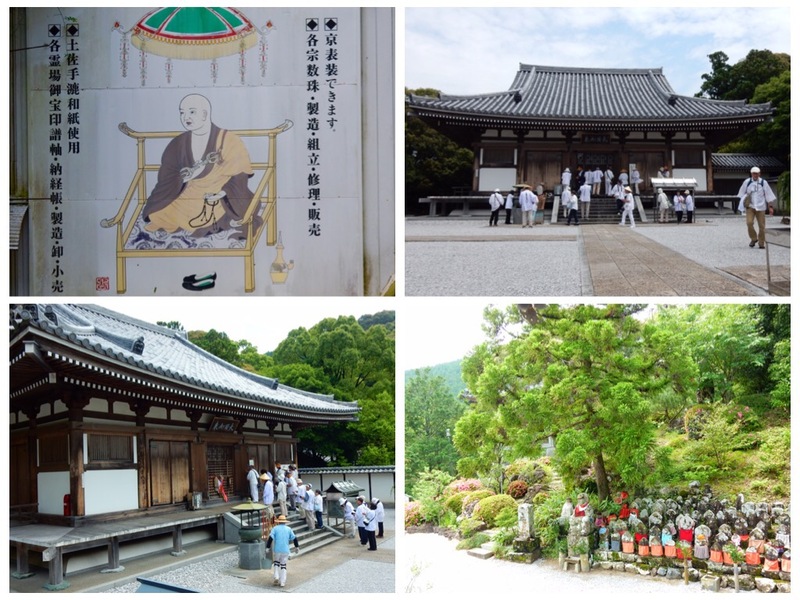 At Zenrakuji, we took our time to purify, light incense, chant and enjoy the place. The lady in the office who did the calligraphy stamp in our pilgrim’s book, gave us a taste of an Umebushi Osettai (an ossetai is a gift to pilgrims). The plum was cooked with honey and then left to semi dry. That night, back in the city, we decided to make our way to the Starbucks to have some Earl Grey tea. Across from the Starbucks was a restaurant whose specialty is Bonito Tataki, which is Tuna grilled or charred on coals. In this place they made a fire from rice straw and charred the tuna directly on the flames. The inside is still raw, and it is served with thin slices of raw garlic and onion, and a lemony soy sauce. It is a speciality of Kochi and we have had it in almost all of the places at which we have stayed. On our way back to our hotel, I bought an array of lotions for my feet. That night in the large and soothing hot springs Onsen, I rotated between the dimly lit inside pool, to the outdoor bath under the starry sky. It was so lovely and pleasant. I am in awe of the capacity of my body to recover overnight.